The joy that comes with food doesn’t end with eating. The preparation and anticipation also has its fair share in the whole experience because I find cooking very liberating. What I find enjoyable in cooking is that you get to be in full command. Unlike photography for example where you could be limited by with what you have in front of you and the best you can do is make the most of it. It is true that in Photography the opportunities are infinite but if there were varying degrees of infinity Cooking is on a larger horizon than Photography. Hopefully this doesn’t spark a violent reaction to some but a mere push for a meaningful discussion will do. So how do I cook? Not being a natural kitchen rat. I honestly have a limited repertoire of cuisine under my belt. Part of it is because of my poor memory and part because of the fact that I have only began appreciating cooking recently. So how do I cook then? Hormones or maybe some chemical reaction in my brain would swerve my thoughts on a particular dish. For example the trusty “Laing”. 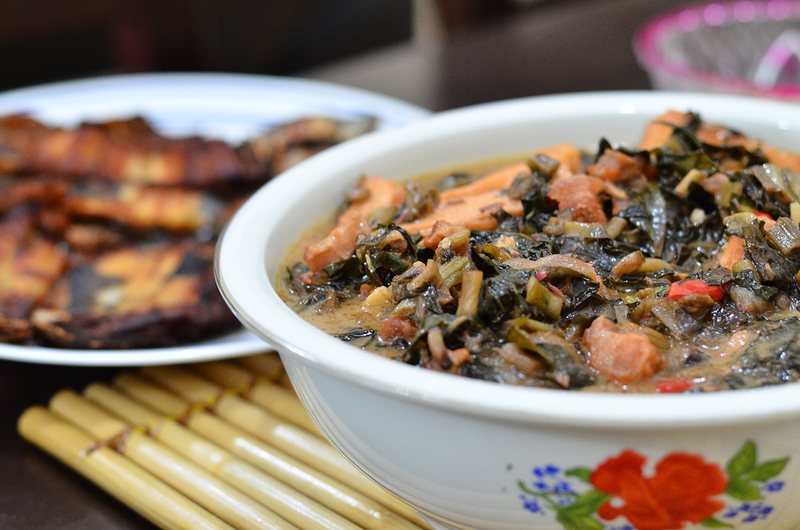 Laing is a dish consisting of Gabi Leaves slow-cooked in Coconut Milk. This dish being popular in the Bicol Region of the Philippines is usually flavored hot although this dish when served in Manila tends to be more forgiving in the hot-ness category. On this occassion, I had my mind set on making the Laing. Mind you, I have never cooked Laing before but this is usually the case for most of the dishes I make. Except for the staple Monggo, Baguio Beans and Kangkong dishes which I have done countless of times, the Laing will be the first for me. So there I was buying the ingredients from the Supermarket and then realizing I missed something else and end up buying again this time at the “Talipapa” (roadside market). I am to some degree a neat-freak so I normally slice up and wash up everything before I start heating up the pan. I find it more enjoyable when everything is ready to drop so I can just focus on getting the taste right. Unfortunately, the Gabi leaves were bought a week before I actually got to cook Laing and at the same time I bought some Tofu together with other stuff intended for another dish. I love Tofu by the way and I prefer to cook my Tofu deep-fried in oil with some salt and cook it until crispy. Not golden brown or well done but Crispy. Back to the Laing. So I was preparing the ingredients and I find the Gabi Leaves frozen. Thinking that my goal was compromised, I tried to thaw the leaves under the 11am sun. Eventually they broke free and what I ended up was a sort of soggy bunch of leaves which as I can recall is not the ideal way for Gabi Leaves to be unless it was anything else but Laing. Sniffing the leaves here and there hoping that I don’t come across a funky smell that will spell the end of the Gabi Leaves, I was fortunate that they seemed okay. So what I did was wash the leaves very very well just to be sure and squeeze them dry so they still have space in them to absorb the Coconut Milk. As for the Coconut Milk, I am guilty of going for the shortcut and I bought the dehydrated type that you see often now in the Supermarkets. These instant sauces vary from Coconut Milk to Sweet and Sour Sauce to anything you can think of. I even find instant versions of Tom Yam which I hope to try in the near future. Putting everything together was pretty basic. What goes on after is the part I enjoyed most. Being at the helm of the flavor. One way or the other, I had the impression that “Bagoong” (fermented shrimp-lings) is an ingredient of the Laing and so I put them in. Amazingly, the aroma of the base and the Bagoong was so inviting that my wife who was busy Facebooking or maybe doing some Office stuff got interested and took a peak. The reassuring words from my ever supportive wife somehow told me I was on the right path. Enough for another curious experiment to sneak in. Remember the Tofu I bought, usually, Tofu doesn’t have a long shelf life or fridge life for some. So I thought, I could slice them and make them a part of the dish. I have by the way some nice slices of Pork Belly in the mix which I toasted before adding Bagoong. And so I did. Pork Belly, Bagoong and Tofu in the mix. Probably anybody who was looking wouldn’t have guessed that it was Laing that I was trying to cook but then when I finally poured in the Coconut Milk and sprinkled the Gabi Leaves evenly all over it became apparent that it will have to be Laing one way or the other! And there it was! Laing finally. Me and my wife enjoyed it and got ourselves so full that afternoon. I told her to watch out maybe for a few hours because if the Gabi Leaves have gone rogue we will be running for the toilet.